Fireweed Zinc: Rapidly Advancing A World Class Zinc Project In The Yukon | Energy and Gold Ltd. In the murky junior resource sector in which missed timelines are the norm and disappointments are abundant, it is refreshing when a company exceeds expectations and advances a project rapidly. 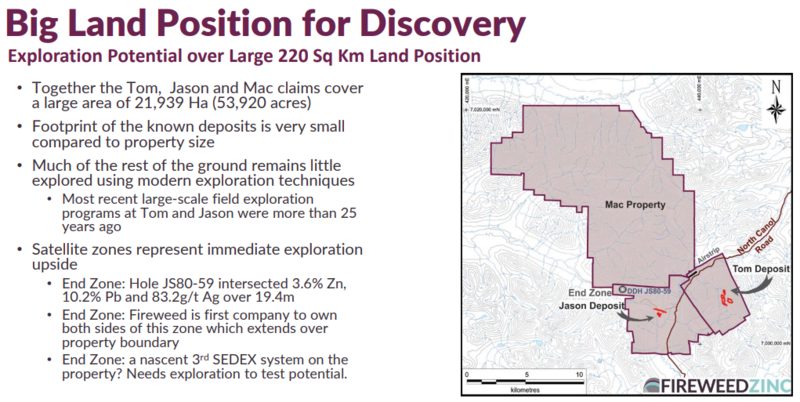 Such is the case with Fireweed Zinc (TSX-V:FWZ), a Yukon zinc resource developer that has rapidly advanced its Macmillan Pass Zinc Project (comprised of the ‘Tom’ and ‘Jason’ deposits) since its shares began trading on the TSX-Venture last June. Under the leadership of CEO Brandon Macdonald, Fireweed conducted a highly successful 2017 drill program that served to outline a larger resource than the market had previously anticipated. The company rapidly moved to release an updated 43-101 compliant resource estimate in January, which blew away expectations with 11.21 million tonnes indicated grading 9.61% zinc-equivalent and 39.47 million tonnes inferred grading 10.00% zinc-equivalent. This resource estimate puts Macmillan Pass into the world class category of projects boasting 50+ million tonne resources. Now Fireweed is putting the finishing touches on its maiden PEA for Macmillan Pass, and the best part is that there’s a good chance the project is even bigger than the resource estimate being used for the PEA. While Fireweed had a sensational exploration program in 2017 by all accounts, there is still substantial blue sky potential as the footprint of the known deposits is very small compared to the total property size. CEO Macdonald doesn’t hold anything back when he makes it clear that he is optimistic that Fireweed will find more mineralized zones over its 114,000 acre property package. Connecting the two sides will require deep drilling, but it could pay off handsomely with substantial resource expansion. Release of maiden PEA that will lay out project economics in detail and address concerns around transport costs etc. Infill drilling, which will upgrade a substantial amount of the inferred pounds to the measured and indicated categories. 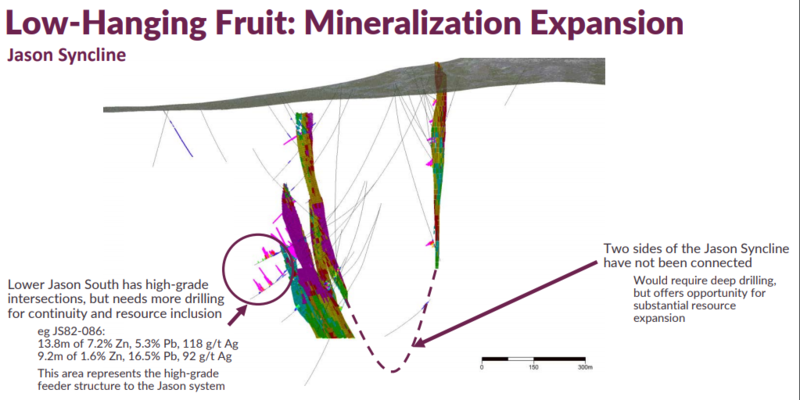 Infill drilling will be important in high grade areas early in the mine life that are currently inferred right now. It’s important for Fireweed to show investors and potential acquirers that the areas that are really driving the economics have been de-risked. Step-out drilling to add tonnes to the total project size, in addition to finding new high-grade zones, which will serve to significantly improve project economics by reducing payback period and reduce marginal cost per tonne produced. 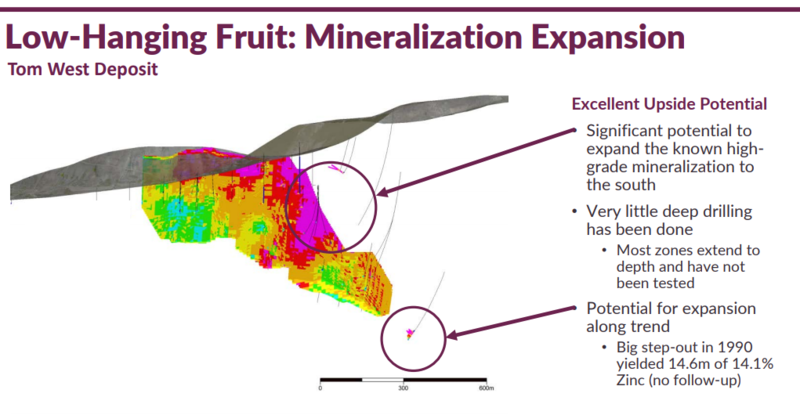 The step-out holes will be prioritized by areas that Fireweed feels are higher grade and would replace other, lower grade tonnes early in the mine life i.e. if there is a block of 1M tonnes at 8% ZnEq in the first 10 years of mine life, and FWZ can replace that block with 1M tonnes at 12% ZnEq, they’d want to do that, of course. Exploration drilling – drill new targets and prove up entirely new deposits. 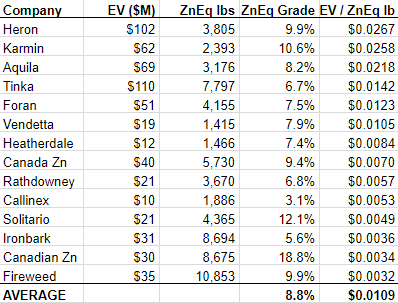 Ironbark Zinc (IBG.AX) is valued at ~10% more than Fireweed based upon the standard enterprise value/Zinc-equivalent pounds in the ground valuation metric. Fireweed has nearly twice the grade that Ironbark has (9.9% vs. 5.6%), more contained metal, and Fireweed’s Macmillan Pass Project is located in a much easier place to work (Yukon vs. Greenland). Yet after all of that Fireweed is still trading at a discount to Ironbark, and virtually every other zinc exploration peer. I believe that 2018 could be the year that FWZ shares bridge a significant amount of this valuation gap. After more than 15 years of investing in the junior resource sector, I have come to learn how important share structure can be. Perhaps, more importantly, a company’s share structure speaks to a company’s culture, and how it operates towards either maximizing shareholder value or something else less beneficial for shareholders (running the company only in management’s short term interest i.e. lifestyle companies). I can state emphatically that Fireweed management, led by CEO Brandon Macdonald and Executive Chairman John Robins, cares tremendously about maximizing shareholder value and avoiding the sort of damaging dilutions that end up ruining so many junior mining companies. Due to its clean share structure and small number of warrants outstanding, Fireweed’s share price could potentially soar in the event of strong buying demand, simply due to the fact that there isn’t a large supply of shares available out there. Growing the total resource by 50% or more. Delivering a positive PFS or being taken out. As Fireweed prepares to set out on a busy summer exploration program the maiden PEA, which is set to be announced in the middle of May, could serve to amplify the value of the Summer 2018 drilling program; upgrading priority zones to the measured & indicated categories will be very important as the company moves closer to a pre-feasibility study, and expansion of known zones through step-outs and exploration drilling of entirely new targets will give plenty of potential upside juice. This consolidation could be nearing its end as Fireweed gets ready to publish its maiden PEA, followed by a busy summer of drilling at Macmillan Pass. There should be a steady flow of news throughout the rest of 2018, and Fireweed’s modest market capitalization (C$43 million based upon C$1.43 share price and 30 million shares outstanding) has substantial room to revalue upward, as the market begins to appreciate the world class size, grade, and location of the Macmillan Pass Project.